There seems to be no group more uncomfortable talking about race then White people. 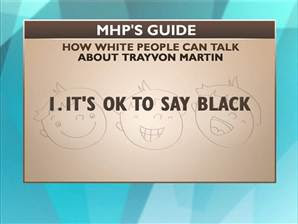 So in light of this, MSNBC host Dr. Melissa Harris Perry decided to come up with a set of rules to help White people navigate the racial road when it comes to the Tragedy involving Trayvon Martin. You know, I was all prepared to object to rule number 6: Silence is Golden. I really was. Then I watched the video. And got it. Not the kind of silence that can be mistaken for lack of interest or lack of agreement - but the kind where you listen.